We’ve compiled a list of the most common and frequently asked finance interview questions. If you want to ace your finance interview, then make sure you master the answers to these challenging questions below. This guide is perfect for anyone interviewing for a financial analyst jobGuide to Becoming a Financial AnalystHow to become a financial analyst. Follow CFI's guide on becoming a financial analyst - networking, resume, interviews, financial modeling skills and more. We've seen thousands of people become financial analysts over the years and know precisely what it takes. and it’s based on real questions asked at global investment banksBulge Bracket Investment BanksBulge Bracket investment banks are the top global investment banks. The list includes companies such as Goldman Sachs, Morgan Stanley, BAML, and JP Morgan. What is a Bulge Bracket Investment Bank and to make hiring decisions. In conjunction with this comprehensive guide to finance interview questions (and answers), you may also want to read our guide on how to be a great financial analyst, where we outline “The Analyst TrifectaThe Analyst Trifecta® GuideThe ultimate guide on how to be a world-class financial analyst. Do you want to be a world-class financial analyst? Are you looking to follow industry-leading best practices and stand out from the crowd? 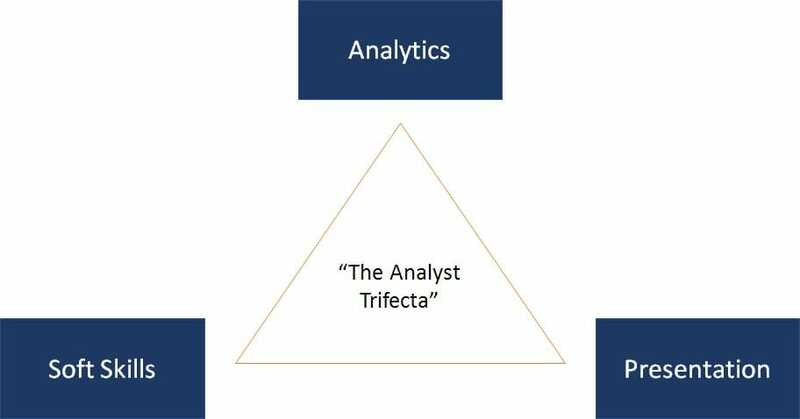 Our process, called The Analyst Trifecta® consists of analytics, presentation & soft skills“. #1 Behavioral and fit questions relate more to soft skills such as your ability to work with a team, leadershipLeadership TraitsLeadership traits refer to personal qualities that define effective leaders. Leadership refers to the ability of an individual or an organization to guide individuals, teams, or organizations towards the fulfillment of overall goals and objectives. This list of leadership traits will explain each one, commitment, creative thinking, and your overall personality type. Being prepared for these types of questions is critical and the best strategy is to pick 5-7 examples of specific situations from your resume that you can use as examples of leadership, teamwork, a weaknessPublic Speaking WeaknessThe "public speaking weakness" answer is a great way to get around the question, "what is your biggest weakness?". If public speaking is not required for the job, then it's a safe answer because it will not really impact your job performance, and yet it's a very common and relatable weakness for most people. This guide, hard work, problem-solving, etc. To help you tackle this aspect of the interview we’ve created a separate guide to behavioral interview questionsInterviewsAce your next interview! Check out CFI's interview guides with the most common questions and best answers for any corporate finance job position. Interview questions and answer for finance, accounting, investment banking, equity research, commercial banking, FP&A, more! Free guides and practice to ace your interview. #2 Technical questions are related to specific accountingAccountingOur Accounting guides and resources are designed as self-study guides to learn accounting and finance at your own pace. Browse hundreds of articles on important topics such as the income statement, balance sheet, cash flow statement, depreciation methods, how to link the 3 statements, debits & credits, journal entries and financeFinanceCFI's Finance Articles are designed as self-study guides to learn important finance concepts online at your own pace. Browse hundreds of finance articles and guides to learn about the cost of capital, financial analysis, ratios, multiples, rates of return, profitability metics, and how to evaluate the overall topics. This guide focuses exclusively on technical finance interview questions. Take a couple of seconds to plan your answer and repeat the question back to the interviewer out loud (you buy some time by repeating part of the question back at the start of your answer). Use a structured approach to answering each question, this typically means having points 1, 2 and 3, for example. Be as organized as possible. If you don’t know the exact answer, state the things you do know that are relevant (and don’t be afraid to say “I don’t know exactly”, which is much better than guessing or making stuff up). Demonstrate your line of reasoning (show that you have a logical thought process and can solve problems, even if you don’t know the exact answer). Walk me through the three financial statements. The balance sheetBalance SheetThe balance sheet is one of the three fundamental financial statements. These statements are key to both financial modeling and accounting. The balance sheet displays the company’s total assets, and how these assets are financed, through either debt or equity. Assets = Liabilities + Equity shows a company’s assets, its liabilities, and shareholders’ equity (put another way: what it owns, what it owes, and its net worth). The income statementIncome StatementThe Income Statement (or Statement of Profit and Loss) shows performance from operations of a business. The financial statement begins with revenues and outlines the company’s revenuesSales RevenueSales revenue is the starting point of the income statement. Sales or revenue is the money earned from the company providing its goods or services, income, expenses, and net income. The cash flow statementCash Flow Statement​A Cash Flow Statement (officially called the Statement of Cash Flows) contains information on how much cash a company has generated and used during a given period. It contains 3 sections: cash from operations, cash from investing and cash from financing. shows cash inflows and outflows from three areas: operating activities, investing activities, and financing activities. If I could use only one statement to review the overall health of a company, which statement would I use and why? Cash is king. The statement of cash flowsStatement of Cash FlowsThe Statement of Cash Flows is one of the 3 key financial statements that reports the cash generated and spent during a specific time period, it acts as a bridge between the income statement and balance sheet gives a true picture of how much cash the company is generating. Ironically, it often gets the least attention. You can probably pick a different answer for this question, but you need to provide a good justification (e.g. the balance sheet because assets are the true driver of cash flow; or the income statement because it shows the earning power and profitability of a company on a smoothed out accrualAccrualIn financial accounting or accrual accounting, accruals refer to the recording of revenues that a company may make, but it has yet to receive, or the expenses that it may incur on credit, but it has yet to pay. In simple terms, it is the adjustment of accumulated debts and credits. Such accounting practices, therefore, basis). If it were up to you, what would our company’s budgeting process look like? This is somewhat subjective. A good budgetTypes of BudgetsThere are four common types of budgeting methods that companies use: (1) incremental, (2) activity-based, (3) value proposition, and (4) zero-based. These four types of budgeting each have advantages and challenges, which will be discussed in more detail in this guide. Incremental budgeting takes last year’s actual is one that has buy-in from all departments in the company, is realistic yet strives for achievement, has been risk-adjusted to allow for a margin of error, and is tied to the company’s overall strategic planStrategic PlanningStrategic planning is the art of formulating business strategies, implementing them, and evaluating their impact based on organizational objectives. The. In order to achieve this, the budget needs to be an iterative process that includes all departments. It can be zero-basedZero-Based BudgetingZero-based budgeting (ZBB) is a budgeting technique that allocates funding based on efficiency and necessity rather than on budget history. Management starts from scratch and develops a budget that only includes operations and expenses essential to running the business; there are no expenses that are automatically added to the budget. (starting from scratch each time) or building off the previous year, but it depends on what type of business you’re running as to which approach is better. It’s important to have a good budgeting/planning calendar that everyone can follow. When should a company consider issuing debt instead of equity? A company should always optimize its capital structureCapital StructureCapital Structure refers to the amount of debt and/or equity employed by a firm to fund its operations and finance its assets. The structure is typically expressed as a debt-to-equity or debt-to-capital ratio. Debt and equity capital are used to fund a business’ operations, capital expenditures, acquisitions,. If it has taxable income, then it can benefit from the tax shieldTax ShieldA Tax Shield is an allowable deduction from taxable income that results in a reduction of taxes owed. The value of these shields depends on the effective tax rate for the corporation or individual. Common expenses that are deductible include depreciation, amortization, mortgage payments and interest expense of issuing debt. If the firm has immediately steady cash flows and is able to make the required interest paymentsInterest ExpenseInterest expense arises out of a company that finances through debt or capital leases. Interest is found in the income statement, but can also be calculated through the debt schedule. The schedule should outline all the major pieces of debt a company has on its balance sheet, and calculate interest by multiplying the, then it may make sense to issue debt if it lowers the company’s weighted average cost of capitalCost of CapitalCost of capital is the minimum rate of return that a business must earn before generating value. Before a business can turn a profit, it must at least generate sufficient income to cover the cost of the capital it uses to fund its operations. Cost of capital consists of both the cost of debt and the cost of equity. How do you calculate the WACC? WACC (stands for Weighted Average Cost of Capital) is calculated by taking the percentage of debt to total capital, multiplied by the debt interest rate, multiplied by one minus the effective tax rate, plus the percentage of equity to capital, multiplied by the required return on equity. Learn more in CFI’s free Guide to Understanding WACCWACCWACC is a firm’s Weighted Average Cost of Capital and represents its blended cost of capital including equity and debt. The WACC formula is = (E/V x Re) + ((D/V x Rd) x (1-T)). This guide will provide an overview of what it is, why its used, how to calculate it, and also provides a downloadable WACC calculator. Which is cheaper, debt or equity? Debt is cheaper because it is paid before equity and has collateralCollateralCollateral is an asset or property that an individual offers to a lender whenever he wants to acquire a loan. It is used as a way to obtain a loan which, at the same time, acts as a protection for the lender should the borrower default in his payments. backing it. Debt ranks ahead of equity on liquidationNet Asset LiquidationNet asset liquidation or net asset dissolution is the process by which a business sells off its net assets and ceases operation thereafter. Although net of the business. There are pros and cons to financing with debt vs equity that a business needs to consider. It is not automatically better to use debt financing simply because it’s cheaper. A good answer to the question may highlight the tradeoffs, if there is any followup required. Learn more about the cost of debtCost of DebtThe cost of debt is the return that a company provides to its debtholders and creditors. Cost of debt is used in WACC calculations for valuation analysis. Learn the formula and methods to calculate cost of debt for a company based on yield to maturity, tax rates, credit ratings, interest rates, coupons, and and cost of equityCost of EquityCost of Equity is the rate of return a shareholder requires for investing in a business. The rate of return required is based on the level of risk associated with the investment, which is measured as the historical volatility of returns. Learn the cost of equity formula with examples and download the Excel calculator. A company has learned that due to a new accounting rule, it can start capitalizing R&D costs instead of expensing them. Part I) What is the impact on the company’s EBITDAEBITDAEBITDA or Earnings Before Interest, Tax, Depreciation, Amortization is a company's profits before any of these net deductions are made. EBITDA focuses on the operating decisions of a business because it looks at the business’ profitability from core operations before the impact of capital structure. Formula, examples? Part II) What is the impact on the company’s Net IncomeNet IncomeNet Income is a key line item, not only in the income statement, but in all three core financial statements. While it is arrived at through the income statement, the net profit is also used in both the balance sheet and the cash flow statement.? Part III) What is the impact on the company’s cash flowCash FlowCash Flow (CF) is the increase or decrease in the amount of money a business, institution, or individual has. In finance, the term is used to describe the amount of cash (currency) that is generated or consumed in a given time period. There are many types of CF? Part IV) What is the impact on the company’s valuationValuation MethodsWhen valuing a company as a going concern there are three main valuation methods used: DCF analysis, comparable companies, and precedent transactions. These methods of valuation are used in investment banking, equity research, private equity, corporate development, mergers & acquisitions, leveraged buyouts and finance? Part I) EBITDAEBITDAEBITDA or Earnings Before Interest, Tax, Depreciation, Amortization is a company's profits before any of these net deductions are made. EBITDA focuses on the operating decisions of a business because it looks at the business’ profitability from core operations before the impact of capital structure. Formula, examples increases by the exact amount of R&D expense that is capitalized. Part II) Net IncomeNet IncomeNet Income is a key line item, not only in the income statement, but in all three core financial statements. While it is arrived at through the income statement, the net profit is also used in both the balance sheet and the cash flow statement. increases, and the amount depends on the depreciation methodDepreciation MethodsThe most common types of depreciation methods include straight-line, double declining balance, units of production, and sum of years digits. There are various formulas for calculating depreciation of an asset and tax treatment. Part III) Cash flowCash FlowCash Flow (CF) is the increase or decrease in the amount of money a business, institution, or individual has. In finance, the term is used to describe the amount of cash (currency) that is generated or consumed in a given time period. There are many types of CF is almost unimpacted – however, cash taxes may be different due to changes in depreciation expense, and therefore cash flow could be slightly different. Part IV) ValuationValuation MethodsWhen valuing a company as a going concern there are three main valuation methods used: DCF analysis, comparable companies, and precedent transactions. These methods of valuation are used in investment banking, equity research, private equity, corporate development, mergers & acquisitions, leveraged buyouts and finance is essentially constant – except for the cash taxes impact/timing impact on the net present value (NPV)Net Present Value (NPV)Net Present Value (NPV) is the value of all future cash flows (positive and negative) over the entire life of an investment discounted to the present. NPV analysis is a form of intrinsic valuation and is used extensively across finance and accounting for determining the value of a business, investment security, of cash flows. What, in your opinion, makes a good financial model? It’s important to have strong financial modelingWhat is Financial ModelingFinancial modeling is performed in Excel to forecast a company's financial performance. Overview of what is financial modeling, how & why to build a model. A 3 statement model links income statement, balance sheet, and cash flow statement. More advanced types of financial models are built for valuation, plannnig, and principles. Wherever possible, model assumptions (inputs) should be in one place and distinctly colored (bank models typically use a blue font for model inputs). Good Excel models also make it easy for users to understand how inputs are translated into outputs. Good models also include error checks to ensure the model is working correctly (e.g., the balance sheet balances, the cash flow calculations are correct, etc.). 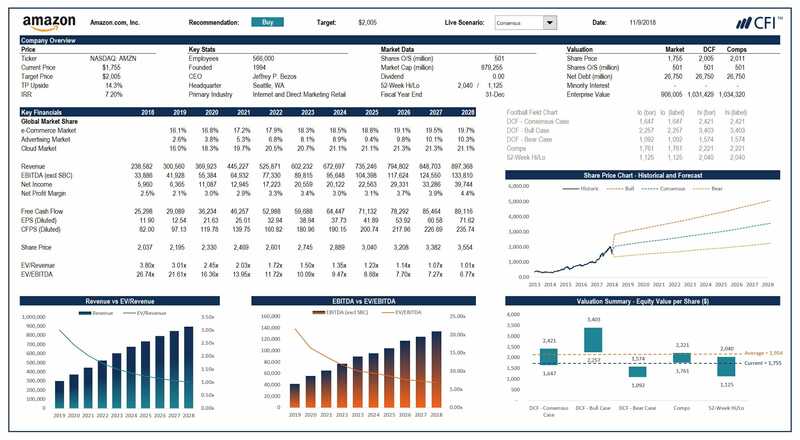 They contain enough detail, but not too much, and they have a dashboardFinancial Modeling Dashboard that clearly displays the key outputs with charts and graphsTypes of GraphsTop 10 types of graphs for data presentation you must use - examples, tips, formatting, how to use these different graphs for effective communication and in presentations. Download the Excel template with bar chart, line chart, pie chart, histogram, waterfall, scatterplot, combo graph (bar and line), gauge chart,. For more, check out CFI’s complete guide to financial modelingFree Financial Modeling GuideThis financial modeling guide covers Excel tips and best practices on assumptions, drivers, forecasting, linking the three statements, DCF analysis, Excel modeling and much more. Designed to be the best free modeling guide for analysts by using examples and step by step instructions. Investment banking, FP&A, research. Image: CFI’s Financial Modeling Courses. What happens on the income statement if inventory goes up by $10? Nothing. This is a trick question – only the balance sheetBalance SheetThe balance sheet is one of the three fundamental financial statements. These statements are key to both financial modeling and accounting. The balance sheet displays the company’s total assets, and how these assets are financed, through either debt or equity. Assets = Liabilities + Equity and cash flow statements are impacted by the purchasing of inventoryInventoryInventory is a current asset account found on the balance sheet consisting of all raw materials, work-in-progress, and finished goods that a company has accumulated. It is often deemed the most illiquid of all current assets, and thus it is excluded from the numerator in the quick ratio calculation.. Working capitalNet Working CapitalNet Working Capital (NWC) is the difference between a company's current assets (net of cash) and current liabilities (net of debt) on its balance sheet. It is a measure of a company’s liquidity and its ability to meet short-term obligations as well as fund operations of the business. The ideal position is to is typically defined as current assets minus current liabilities. In banking, working capital is normally defined more narrowly as current assets (excluding cash) less current liabilities (excluding interest-bearing debt). Sometimes its even more narrowly defined as accounts receivableAccounts ReceivableAccounts Receivable (AR) represents the credit sales of a business, which are not yet fully paid by its customers, a current asset on the balance sheet. Companies allow their clients to pay at a reasonable, extended period of time, provided that the terms are agreed upon. plus inventory minus accounts payableAccounts PayableAccounts payable is a liability incurred when an organization receives goods or services from its suppliers on credit. Accounts payables are expected to be to be paid off within a year’s time, or within one operating cycle (whichever is longer). AP is considered one of the most liquid forms of current liabilities. By knowing all three of these definitions you can provide a very thorough answer. Negative working capital is common in some industries such as grocery retail and the restaurant business. For a grocery store, customers pay upfront, inventory moves relatively quickly, but suppliers often give 30 days (or more) credit. This means that the company receives cash from customers before it needs the cash to pay suppliers. Negative working capital is a sign of efficiency in businesses with low inventory and accounts receivable. In other situations, negative working capital may signal a company is facing financial trouble if it doesn’t have enough cash to pay its current liabilities. In this answer to this interview question, it’s important to consider the company’s normal working capital cycleWorking Capital CycleThe working capital cycle for a business is the length of time it takes to convert net working capital (current assets less current liabilities) all into cash. Businesses typically try to manage this cycle by selling inventory quickly,. When do you capitalize rather than expense a purchase? If the purchase will be used in the business for more than one year, it is capitalized and depreciatedDepreciation ExpenseDepreciation expense is used to reduce the value of plant, property, and equipment to match its use, and wear and tear over time. Depreciation expense is used to better match the expense of a long-term asset to the revenue it generates. according to the company’s accounting policies. How do you record PP&E and why is this important? There are essentially four areas to consider when accounting for Property, Plant & EquipmentPP&E (Property, Plant and Equipment)PP&E (Property, Plant, and Equipment) is one of the core non-current assets found on the balance sheet. PP&E is impacted by Capex, Depreciation and Acquisitions/Dispositions of fixed assets. These assets play a key part in the financial planning and analysis of a company’s operations and future expenditures (PP&E) on the balance sheet: (I) initial purchase, (II) depreciation, (III) additions (capital expendituresCapital ExpendituresCapital expenditures refer to funds that are used by a company for the purchase, improvement, or maintenance of long-term assets to improve the efficiency), and (IV) dispositions. In addition to these four, you may also have to consider revaluation. For many businesses, PP&E is the main capital asset that generates revenue, profitability, and cash flow. How does an inventory write-down affect the three financial statements? This is a classic finance interview question. On the balance sheet, the asset account of inventory is reduced by the amount of the write-down, and so is shareholders’ equity.Stockholders EquityStockholders Equity (also known as Shareholders Equity) is an account on a company's balance sheet that consists of share capital plus retained earnings. It also represents the residual value of assets minus liabilities. By rearranging the original accounting equation, we get Stockholders Equity = Assets – Liabilities The income statement is hit with an expense in either cost of goods sold (COGS) or a separate line item for the amount of the write-down, reducing net income. On the cash flow statement, the write-down is added back to cash from operating activitiesOperating Cash FlowOperating Cash Flow (OCF) is the amount of cash generated by the regular operating activities of a business in a specific time period. The operating cash flow formula is net income (form the bottom of the income statement), plus any non-cash items, plus adjustments for changes in working capital, as it’s a non-cash expenseNon Cash ExpensesNon cash expenses appear on an income statement because accounting principles require them to be recorded despite not actually being paid for with cash. The most common example of a non cash expense is depreciation, where the cost of an asset is spread out over time (but must not be double counted in the changes of non-cash working capital). Read more about an inventory write-downInventory Write DownInventory write down is a process that is used to show the reduction of an inventory’s value, when the inventory’s market value drops below its book value. Inventory write-down should be treated as an expense, which will reduce net income. The write-down also reduces the owner’s equity..
Why would two companies merge? What major factors drive mergers and acquisitions? There are many reasons companies go through the M&A processMergers Acquisitions M&A ProcessThis guide takes you through all the steps in the M&A process. Learn how mergers and acquisitions and deals are completed. In this guide, we'll outline the acquisition process from start to finish, the various types of acquirers (strategic vs. financial buys), the importance of synergies, and transaction costs: to achieve synergiesM&A SynergiesM&A Synergies occur when the value of a merged company is higher than the sum of the two individual companies. 10 ways to estimate operational synergies in M&A deals are: 1) analyze headcount, 2) look at ways to consolidate vendors, 3) evaluate any head office or rent savings 4) estimate the value saved by sharing (cost savings), enter new markets, gain new technology, eliminate a competitor, and because it’s “accretive” to financial metrics. Learn more about accretion/dilution in M&AAccretion DilutionAccretion Dilution Analysis is a simple test used to determine whether the proposed merger or acquisition will increase or decrease post-transaction EPS. If you were CFO of our company, what would keep you up at night? This is one of the great finance interview questions. Step back and give a high-level overview of the company’s current financial position, or the position of companies in that industry in general. Highlight something on each of the three financial statements. Income statement: growth rates, margins, and profitabilityProfitability RatiosProfitability ratios are financial metrics used by analysts and investors to measure and evaluate the ability of a company to generate income (profit) relative to revenue, balance sheet assets, operating costs, and shareholders' equity during a specific period of time. They show how well a company utilizes its assets. Balance sheet: liquidity, capital assets, credit metrics, liquidity ratios, leverageLeverageLeverage is a strategy that companies use to magnify returns, though it may also magnify losses. To increase Financial Leverage, a firm may borrow capital through issuing fixed-income securities (preferred equity and debt). Operating Leverage can be attained through fixed operating expenses., return on assest (ROAReturn on Assets & ROA FormulaReturn on assets (ROA), a form of return on investment, measures the profitability of a business in relation to its total assets. The ROA formula is used to indicate how well a company is performing by comparing the profit it's generating to the capital it's invested in assets. The higher the return, the more), and return on equity (ROEReturn on Equity (ROE)Return on Equity (ROE) is a measure of a company’s profitability that takes a company’s annual return (net income) divided by the value of its total shareholders' equity (i.e. 12%). ROE combines the income statement and the balance sheet as the net income or profit is compared to the shareholders’ equity.). Cash flow statement: short-term and long-term cash flow profile, any need to raise money or return capital to shareholders. Non-financial statement: company culture, government regulation, conditions in the capital marketsCapital MarketsIn capital markets, equity-backed securities and long-term debt are both bought and sold. Major financial regulators, such as the U.S. Securities and Exchange Commission (SEC) are responsible for overseeing the capital markets. The regulators ensure that the investments made by savers are directed toward major. This has been CFI’s guide to finance interview questions and answers. We’ve also published numerous other types of interview guides. The best way to be good at interviews is to practice, so we recommend reading the most common questions and answers below to be sure you’re prepared for anything! Macroeconomics interviewsEconomics Interview QuestionsThe most common economics interview questions. For anyone with an interview for an analyst position in at a bank or other institution, this is a guide. While there are an unlimited number of economics questions you could be asked, these questions will give you a sense of the types of questions you could get. Behavioral interview questionsBehavioral Interview QuestionsBehavioral interview questions and answers. This list includes the most common interview questions and answers for finance jobs and behavioral soft skills. Behavioral interview questions are very common for finance jobs, and yet applicants are often under-prepared for them.